We have published numerous reports of studies over the years examining the endocrine disrupting effects of common chemicals: phthalates, parabens and triclosan. Now the results of a new study indicate that these chemicals–widely used in personal care and household products–are linked to girls entering puberty at earlier ages. More specifically, the study found that chemicals such as phthalates, parabens and phenols were all associated with earlier puberty in girls, although there was no similar association observed in boys. Scientists analyzed data from pregnant women who enrolled in the Center for the Health Assessment of Mothers and Children of Salinas (CHAMACOS) study between 1999-2000. They followed 338 of their children from birth to adolescence. While the mothers were pregnant they were interviewed at around 14 and 27 weeks’ gestation and urine samples were taken in order to measure concentrations of phthalates, parabens and phenols. After birth, the researchers assessed pubertal development in the 179 girls and 159 boys at the age of nine and collected urine samples. Pubertal development was checked again every nine months between the ages of 9 and 13. We found that mothers who had higher levels of two chemicals in their bodies during pregnancy—diethyl phthalate, which is used in fragrance, and triclosan, which is an antibacterial agent in certain soaps and toothpaste—had daughters who entered puberty earlier. We also found that girls with higher levels of parabens in their bodies at the age of nine entered puberty earlier. For every doubling in the concentrations of an indicator for phthalates called monoethyl phthalate (MEP) in the mothers’ urine, the development of pubic hair shifted 1.3 months earlier in girls. For every doubling of triclosan in the mothers’ urine, the timing of the girls’ first menstrual period shifted earlier by just under a month. Earlier puberty in girls increases their risk of mental health problems and risk-taking behavior as teenagers and increases their risk of breast and ovarian cancer over the long-term. Where can these chemicals be found? 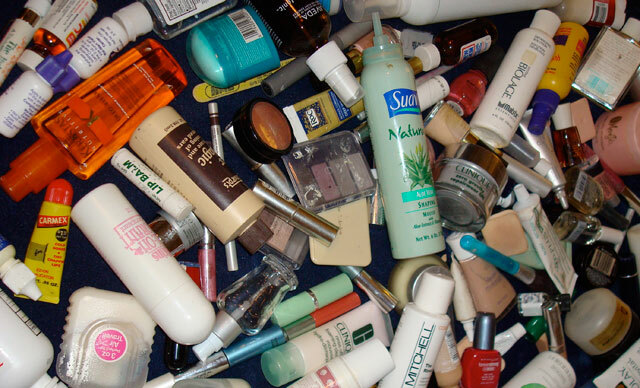 Phthalates: used in scented products such as perfumes, deodorants, soaps, shampoo, nail polish and cosmetics. Watch for products listing “fragrances”. Parabens are often used as preservatives in cosmetics and other personal care products. Phenols (including triclosan and benzophenone-3) are used in soap, toothpaste, lipsticks, hairsprays, shampoos and skin lotion to increase the durability of the products. Chemicals such as phthalates, parabens and triclosan are widespread in U.S. personal care products and household products so it is difficult to avoid them completely. Choosing organic products is one option, another is to DIY it. There are plenty of free online recipes to make personal care products at home. When these options do not work, read the ingredients labels carefully. Since the adverse effects of these chemicals are thought to be dose-dependent there may be strong arguments for minimizing exposure to these chemicals. The most important thing to do to lower exposure is to read the ingredients labels on all products before you decide to purchase them and choose alternatives that specifically state they are free of fragrances, phthalates, parabens and triclosan or antibacterial chemicals.